Wi-Fi services are key to delivering a great workspace experience. Wi-Fi analytics can help you improve capacity planning, discover and close up-sell and cross-sell opportunities, prevent churn and launch timely marketing campaigns to drive demand for unused space such as meeting rooms, event space and desks. *only available to Username based Wi-Fi (Wi-Fi Secure) enabled sites. *The total number of members displayed is based on the number of members last seen within the past 3 months from the selected date. Check if you are on the right track for growth by looking at the number of new members and tenants added within a Month or Custom date such as a Quarter. When you see an increase in the number of new members within a company, you can consider up/cross-sell opportunities around bandwidth and space. Understand changes within your tenant and member structure so that you can spot opportunities or address potential churn. When you see a large number of inactive resident members for an extended period of time, there may be potential churn threats to address. Clicking on any company on the stacked bar will take you to a list containing individual member details: name, email, number of sessions (days), duration of sessions, number of devices connected and MAC address. You can export the list. You can also take a look at the bandwidth graphs for a certain tenant to see what their bandwidth consumption is and whether there's an opportunity to upgrade the service. The Heatmap gives you a site level overview of the busiest times throughout a day, by determining the number of concurrent members seen online during specific intervals. You can see a heatmap for a given Day, Week, Month or custom period and split by Virtual/Lounge, Resident and All Members (Virtual/Lounge & Resident). Improve capacity planning - making sure you have the right number of team members available during the busiest days of the week and times of the day. Deliver just-in-time marketing campaigns to maximise occupancy or space utilization levels by promoting meeting rooms, event space or coworking plans. You can also take a look at the bandwidth graphs for your site to ensure the right level of service is provided during peak times. 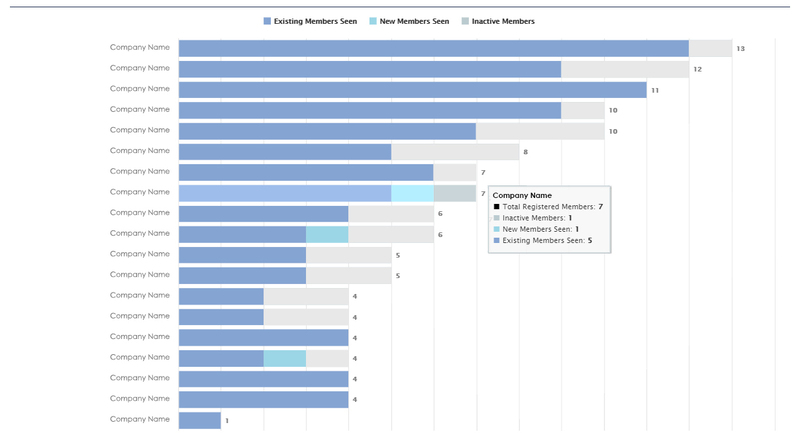 Clicking on a specific time on the heatmap will display a list of members seen online at that time, the start and end time of their sessions. You can export the list. You can select from Day, Week, Month and Custom date views and select a particular Guest to drill down into more detail around times visited. Prevent regular guests and customers from abusing Guest Wi-Fi services by identifying them. Guest Marketing provides details on all those who accessed Guest Wi-Fi within a chosen period of time - Day, Week, Month, Custom. It includes key information provided on the Guest Wi-Fi Splash page, alongside the dates, times and duration of the visits. Communicate easily with prospects especially after walk-in visits or tour requests. Identify any existing members who use Guest Wi-Fi extensively instead of Lounge or Wi-Fi Secure services.